WHO (OMS), "Organización Mundial de la Salud. Diabetes. Día Mundial de la Diabetes. E. Available http://who.int/diabetes/es/index.html [Accessed 6/12/14]," 2013. C. A. Johnston, B. Stevens, and J. P. Foreyt, "The role of the low-calories sweeteners in diabetes," US Endocrinology, vol. 9, pp. 13-21, 2013. P. A. S. Breslin, "An evolutionary perspective on food and human taste," Current Biology., vol. 23, pp. R409-R418, 2013. ADA American Dietetic Association, "Position of the academy of nutrition and dietetics: Use of nutritive and nonnutritive sweeteners," Journal of the American Dietetic Association, vol. 1112, pp. 739-758, 2012. A. Sylvetsky, K. I. Rother, and R. Brown, "Artificial sweetener use among children: Epidemiology, recommendations, metabolic outcomes, and future directions," Pediatric Clinics of North America, vol. 58, pp. 1467–1480, 2011. A. M. Coulston, C. B. Hollenbeck, C. C. Donner, R. Williams, Y. A. Chiou, and G. M. M. Reaven, "Metabolic effects of added dietary sucrose in individuals with noninsulin dependent diabetes mellitus NIDDM," Metabolism, vol. 34, pp. 962-966, 1985. A. M. Coulston, C. B. Hollenbeck, A. L. M. Swislocki, Y. D. I. Chen, and G. M. Reaven, "Deleterious metabolic effects of high-carbohydrate, sucrose-containing diets in patients with non-insulin-dependent diabetes mellitus," American Journal of Medicine, vol. 82, pp. 213-220, 1987. C. Fitch and K. S. Keim, "Position of the academy of nutrition and dietetics: Use of nutritive and nonnutritive sweeteners," Journal of the Academic of Nutrition and Dietetics, vol. 112, pp. 739-758, 2012. B. Caballero, Sucrose: Dietary sucrose and disease. Encyclopedia of human nutrition, 3rd ed. Amsterdam: Elsvier, 2013. P. Shankar, S. Ahuja, and K. Sriram, "Non-nutritive sweeteners: Review and update," Nutrition, vol. 29, p. 12931299, 2013. D. Michael, M. D. Kendig, S. Candy, C. S. Lin, J. E. Beilharz, K. B. Rooney, and R. A. Boakes, "Maltodextrin can produce similar metabolic and cognitive effects to those of sucrose in the rat," Appetite, vol. 77, pp. 1-12, 2014. G. A. Mohamed, S. R. M. Ibrahim, E. S. Elkhayat, and R. S. El Dine, "Natural anti-obesity agents," Bulletin of Faculty of Pharmacy, Cairo University, vol. 53, pp. 269-284, 2014. J. H. Yu, M. S. Shin, J. R. Lee, J. H. Choi, E. H. Koh, W. J. Lee, J. Y. Park, and M. S. Kim, "Decreased sucrose preference in patients with type 2 diabetes mellitus," Diabetes Research and Clinical Practice, vol. 104, pp. 214-219, 2014. D. Cook, D. Haslam, and C. Weir, "The role of low calorie sweeteners in weight management: Evidence and practicalities," Supplement to Diabetes Digest, vol. 12, pp. 1-4, 2013. M. O'Mullane, B. Fields, and G. G. Stanley, "Food additives: Sweeteners," Encyclopedia of Food Safety, vol. 2, pp. 477-484, 2014. K. Rosenman, "Benefits of saccharin: A review," Environmental Research, vol. 15, pp. 70-81. M. Sánchez, M. Luna, Y. Villarreal, Y. Zerpa and A .Bermúdez. Manejo de la hiperglucemia en el paciente hospitalizado con Diabetes Mellitus. Guía práctica del servicio de endocrinología del Instituto Autónomo Hospital Universitario de Los Andes. Revista Venezolana de Endocrinología y Metabolismo, vol. 12 pp. 34-40, 2014, 1978. T. Oku and M. Okazaki, "Laxative threshold of sugar alcohol erythritol in human subjects," Nutrition Research, vol. 16, pp. 577-589, 1996. C. González, M. S. Tapia, E. Pérez, M. Dornier, and G. Morel, "Caracterización de cultivares de stevia rebaudiana bertoni de diferentes procedencias," Bio. Agro., vol. 26, pp. 79-88, 2014a. C. González, M. Tapia, E. Pérez, D. Pallet, and M. Dornier, "Main properties of steviol glycosides and their potential in the food industry: A review," Fruits, vol. 69, pp. 127-141, 2014b. A. D. Kinghorn, Y. W. Chin, L. Pan, and Z. Jia, "Natural products as sweeteners and sweetness modifiers," Comprehensive Natural Products II, vol. 3, pp. 269-315, 2010. J. C. Fry, Natural low-calorie sweeteners. Natural food additives, ingredients and flavourings, Ed. D. Baineand R. Cambridge, UK: Seal Woodhed Pub, 2012. D. D. Kinghorn, Stevia medicinal and aromatic plant /industrial profile. UK: Taylor and Francis, Co, 2002. R. Mehrotra, D. Singh, and A. Tiwari, "Steviol glycosides and their use in food processing: A review," Innovare Journal of Food Science, vol. 2, pp. 7-13, 2014. A. E. Abou-Arab, A. A. Abou-Araband, and M. F. Abu-Salem, "Physico-chemical assessment of natural sweeteners steviosides produced from stevia rebaudiana bertoni plant," African Journal of Food Science, vol. 4, pp. 269- 281, 2010. G. K. Beauchampa and J. A. Mennella, "Early flavor learning and its impact on later feeding behavior," Journal of Pediatric Gastroenterology and Nutrition, vol. 48, pp. S25-30, 2009. L. B. Sjöström and S. E. Cairncross, Chapter 15 role of sweeteners in food flavor. In: Use of sugars and other carbohydrates in the food industry. Cambridge, Mass: Arthur D. Little, Inc, 1955. T.M.R Transparency Market Research, "Non sugar sweeteners market - global industry analysis, size, market share, growth, trends and forecast, 2012–2018. Available http://www.transparencymarketresearch.com/non-sugar-sweeteners.html," 2013. V. M. Sardesai and T. H. Waldshan, "Natural and synthetic intense sweeteners," Journal of Nutritional Biochemistry, vol. 2, pp. 236-244, 1991. L. Monnier and C. Colette, "Les édulcorants: Effets métaboliques et sur la santé: Sweeteners: Metabolic effects and health considerations," Médecine Des Maladies Métaboliques, vol. 4, pp. 537-542, 2010. J. L. Schlienger, "Les édulcorants de masse ou de charge ont-ils leur place dans l’alimentation chez le patient diabétique," Médecine Des Maladies Métaboliques, vol. 7, pp. 483-487, 2013. B. Ahmed, M. Hossain, R. Islam, A. Kumar Saha, and A. Mandal, "Review on natural sweetener plant–stevia having medicinal and commercial importance," Agronomski Glasnik, vol. 1-2, pp. 75-92, 2011. E. Mosettig, U. Beglinger, F. Dolder, H. Lichti, and P. P. Quitt, "The absolute configuration of Steviol and Isosteviol waters," Journal of the American Chemical Society, vol. 85, pp. 2305–2309, 1963. J. E. Brandle and P. G. Telmer, "Steviol glycoside biosynthesis," Phytochemistry, vol. 7, pp. 1855–1863, 2007. G. E. DuBois and R. A. Stephenson, "Diterpenoid sweeteners. 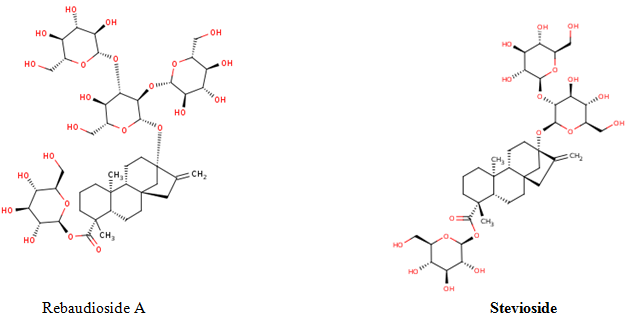 Synthesis and sensory evaluation of stevioside analogues with improved organoleptic properties," Journal of Medical Chemistry, vol. 28, pp. 93–98, 1985. I. Prakash, G. E. DuBois, J. F. Clos, K. L. Wilkens, and L. E. Fosdick, "Development of rebiana a natural, non-caloric sweetener," Food and Chemical Toxicology, vol. 46, pp. S75–S82, 2008. M. C. Carakostas, L. L. Curry, A. C. Boileau, and D. J. Brusick, "Overview: The history, technical function and safety of rebaudioside a, a naturally occurring steviol glycoside, for use in food and beverages," Food and Chemical Toxicology, vol. 46, pp. S1-S10, 2008. L. L. Curry, A. Roberts, and N. Brown, "Rebaudioside a: Two-generation reproductive toxicity study in rats," Food Chemical Toxicology, vol. 46, pp. S21-S30, 2008. K. C. Maki, L. L. Curry, M. C. Carakostas, S. M. Tarka, M. S. Reeves, M. V. Farmer, J. M. McKenney, P. D. Toth, S. L. Schwartz, B. C. Lubin, M. R. Dicklin, A. C. Boileau, and J. D. J. C. Bisognano, "The hemodynamic effects of rebaudioside a in healthy adults with normal and low-normal blood pressure," Food and Chemical Toxicology, vol. 46, pp. S40-S46, 2008. K. C. Maki, L. L. Curry, M. S. Reeves, P. D. Toth, J. M. McKenney, M. V. Farmer, S. L. Schwartz, B. C. Lubin, A. C. Boileau, M. R. Dicklin, M. C. Carakostas, and S. S. M. Tarka, "Chronic consumption of rebaudioside a, a steviol glycoside, in men and women with type 2 diabetes mellitus," Food and Chemical Toxicology, vol. 46, pp. S47-S53, 2008. A. M. Viana and J. Metivier, "Changes in the levels of total soluble proteins and sugars during leaf ontogeny in Stevia rebaudiana Bert," Annal of Botany, vol. 45, pp. 469–475, 1980. R. Lemus-Mondaca, A. Vega-Gálvez, L. Zura-Bravo, and K. Ah-Hen, "Stevia rebaudiana Bertoni, source of a high-potency natural sweetener: A comprehensive review on the biochemical, nutritional and functional aspects," Food Chemistry, vol. 132, pp. 1121-1132, 2012. A. B. Siddique, S. M. Mizanur Rahman, and M. Amzad Hossain, "Chemical composition of essential oil by different extraction methods and fatty acid analysis of the leaves of Stevia rebaudiana Bertoni," Arabian Journal of Chemistry, pp. 1-5, 2012. F. N. Muanda, R. Soulimani, B. Diop, and A. Dicko, "Study on chemical composition and biological activities of essential oil and extracts from Stevia rebaudiana Bertoni leaves," LWT - Food Science and Technology, vol. 44, pp. 1865-1872, 2011. A. Erkucuk, I. H. Akgun, and O. Yesil-Celiktas, "Supercritical CO2 extraction of glycosides from stevia rebaudiana leaves: Identification and optimization," Journal of Supercritical Fluids, vol. 51, pp. 29–35, 2009. I. S. Kim, M. Yang, O. H. Lee, and S. N. Kang, "The antioxidant activity and the bioactive compound content of Stevia rebaudiana water extracts," LWT - Food Science and Technology, vol. 44, pp. 1328-1332, 2011. J. M. C. Geuns, J. Buyse, A. Vankeirsbilck, and E. H. M. Temme, "Metabolism of stevioside by healthy volunteers," Experimental Biology and Medicine, vol. 232, pp. 164–173, 2007. B. Chan, Y. J. Tomlinson, J. C. Chen, M. H. Liu Hsieh, and J. T. Cheng, "A double-blind placebo-controlled study of the effectiveness and tolerability of oral stevioside in human hypertension," British Journal of Clinical Pharmacology, vol. 50, pp. 215-220, 2000. P. B. Jeppesen, S. Gregersen, S. E. D. Rolfsen, M. Jepsen, M. Colombo, A. Agger, J. Xiao, M. Kruhøffer, T. Ørntofta, and K. Hermansen, "Antihyperglycemic and blood pressure-reducing effects of stevioside in the diabetic Goto-Kakizaki rat," Metabolism, vol. 52, pp. 372–378, 2003. R. J. Huxtable, Pharmacology and toxicology of stevioside, rebaudioside a, and steviol. In Stevia: The genus Stevia. London, U.K. / New York, U.S.A: Taylor and Francis, 2002. S. Gregersen, P. B. Jeppesen, J. J. Holst, and K. Hermansen, "Antihyperglycemic effects of stevioside in type 2 diabetic subjects," Metabolism, vol. 53, pp. 73-76, 2004. C. Boonkaewwan, C. Toskulkao, and M. Vongsakul, "Anti-inflammatory and immuno-modulatory activities of stevioside and its metabolite steviol on THP-1 cells," Journal of Agricultural and Food Chemistry, vol. 54, pp. 785–789, 2006. V. Chatsudthipong and C. Muanprasat, "Stevioside and related compounds: Therapeutic benefits beyond sweetness," Pharmacology & Therapeutics, vol. 121, pp. 41–54, 2009. G. Brahmachari, L. C. Mandal, S. Mondal, and A. K. Brahmachari, "Stevioside and related compounds – molecules of pharmaceutical promise: A critical overview," Archiv Der Pharmazie, vol. 344, pp. 5–19, 2011. S. K. Yadav and P. Guleria, "Steviol glycosides from Stevia: Biosynthesis pathway review and their application in foods and medicine," Critical Reviews in Food Science and Nutrition, vol. 52, pp. 988-998, 2012. V. Prakash, J. Clos, and I. Prakash, "Stability study of steviol glycoside in mock beverage using fluorescent light exposure under ICH guidelines," International Journal of Pharmacy and Pharmaceutical Science, vol. 3, pp. 316-323, 2011. Q. Gong and I. N. Bell, "Degradation kinetics of rebaudioside a in various buffer solutions," International Journal of Food Science and Technology, vol. 48, pp. 2500-2505, 2013. P. B. Jeppesen, S. Gregersen, C. R. Poulsen, and K. Hermansen, "Stevioside acts directly on pancreatic beta cells to secrete insulin: Actions independent of cyclic adenosine monophosphate and adenosine triphosphate-sensitive K+-channel activity," Metabolism, vol. 49, pp. 208-214, 2000. J. M. C. Geuns, P. Augustijns, R. Mols, J. G. Buyse, and B. Driessen, "Metabolism of stevioside in pigs and intestinal absorption characteristics of stevioside, rebaudioside a and steviol," Food and Chemical Toxicology, vol. 41, pp. 1599–160, 2003. J. O. Atteh, O. M. Onagbesan, K. Tona, E. Decuypere, J. M. Geuns, and J. Buyse, "Evaluation of supplementary stevia (Stevia Rebaudiana, Bertoni) leaves and stevioside in broiler diets: Effects on feed intake, nutrient metabolism, blood parameters and growth performance," Journal of Animal Physiology and Animal Nutrition Berl, vol. 92, pp. 640-649, 2008. E. Brambilla, M. G. Cagetti, A. Ionescu, G. Campus, and P. Lingström, "An in vitro and in vivo comparison of the effect of Stevia rebaudiana extracts on different caries-related variables: A randomized controlled trial pilot study," Caries Research, vol. 48, pp. 19-23, 2014. A. Craig, C. A. Johnston, B. Stevens, P. John, and J. P. Foreyt, "The role of low-calorie sweeteners in diabetes," US Endocrinology, vol. 9, pp. 13-15, 2013. FDA, "Agency response letter GRAS Notice No. GRN 000348. Re: GRAS Notice No. GRN 000348 2014. Available http://www.fda.gov/Food/IngredientsPackagingLabeling/GRAS/NoticeInventory/ucm267232.htm," 2014. U.S, "U.S. Food and drug administration: GRAS notice inventory. Available http://www.accessdata.fda.gov/scripts/fdcc/?set=GRASNotices," 2014. D. J. Beneford, M. DiNovi, and J. Schlatter, Steviol glycosides. Safety evaluation of certain food additives. In: WHO food additive series. Geneva: WHO, 2006. R. S. McQuate, "Ensuring the safety of sweeteners from Stevia," Food Technology, vol. 65, pp. 42-49, 2011. D. Parent-Massin, "Édulcorants intenses: Point d’actualité sur leur sécurité d’emploi et les dernières innovations," Cahiers De Nutrition et De Diététique, vol. 46, pp. H27-H34, 2011. H. King, R. E. Aubert, and W. H. Herman, "Global burden of diabetes, 1995–2025: Prevalence, numerical estimates, and projections," Diabetes Care, vol. 21, pp. 1414-1431, 1998. P. Zimmet, J. Shaw, S. Murray, and R. Sicree, "La epidemia de diabetes en crecimiento: Predecir el futuro," Diabete Voice, vol. 48, pp. 12-16, 2003. S. Wild, G. Roglic, A. Green, R. Sicree, and H. King, "Global prevalence of diabetes estimates for the year 2000 and projections for 2030," Diabetes Care, vol. 27, pp. 1047-1053, 2004. S. Valdés, G. Rojo-Martínez, and F. Soriguer, "Evolución de la prevalencia de la diabetes tipo 2 en población adulta española," Medicina Clínica, vol. 129, pp. 352-355, 2007.
WHO OMS, "Organización mundial de la salud," Diabetes Consultado. Available http://www.who.int/mediacentre/factsheets/fs312/es/index.html. [Accessed 6/12/14], 2013. R. Sicree, J. Shaw, and P. Zimmet, "The global burden diabetes and impaired glucose tolerance." IDF Diabetes Atlas 4th edi, pp. 1-105, 2014. IDF, "Diabetes atlas Sixth edition. Avaialble http://www.idf.org/diabetesatlas/introduction," 2013. G. I. Kourtoglou, "Insulin therapy and exercise," Diabetes Research and Clinical Practice, vol. 93, pp. S73-S77, 2011. J. L. Sievenpiper and P. D. N. Dworatzek, "Food and dietary pattern-based recommendations: An emerging approach to clinical practice guidelines for nutrition therapy in diabetes," Canadian Journal of Diabetes, vol. 37, pp. 51-57, 2013.
WHO World Health Report, Conquering suffering, enriching humanity. Geneva: World Health Organization, 1997. Y. Wang and M. A. Beydoun, "The obesity epidemic in the United States—gender, age, socioeconomic, racial/Ethnic, and geographic characteristics: A systematic review and meta-regression analysis," Epidemiologic Reviews, vol. 29, pp. 6-28, 2007. C. L. Ogden, S. Z. Yanovski, M. D. Carroll, and K. M. Flegal, "The epidemiology of obesity," Gastroenterology, vol. 132, pp. 2087–2102, 2007. M. D. Nguyen and H. B. El-Serag, "The epidemiology of obesity," Gastroenterology Clinics of North America, vol. 39, pp. 1–7, 2010.
WHO, "Global health observatory (GHO). Available http://www.who.int/gho/ncd/risk_factors/obesity_text/en/," 2008. M. A. Charles, "Obesity: What epidemiology tells us?," Cahiers De Nutrition et De Dietetique, vol. 46, pp. 167-172, 2011. M. Mello, "Legal and policy approaches to the obesity epidemic. Surgery for obesity and related," Diseases, vol. 8, pp. 507-513, 2012. R. N. Haththotuwa, C. N. Wijeyaratne, and U. Senarath, 1 - worldwide epidemic of obesity. In: Obesity. Oxford: Elsevier, 2013. J. L. Kraschnewski, K. O. Hwang, D. R. George, E. B. Lehman, and C. N. Sciamann, "Feasibility of utilising an all-volunteer workforce as a disruptive innovation for the US obesity epidemic," Obesity Research & Clinical Practice, vol. 8, pp. e488-e496, 2014. F. J. Santonja and L. Shaikhet, "Probabilistic stability analysis of social obesity epidemic by a delayed stochastic model," Nonlinear Analysis: Real World Applications, vol. 17, pp. 114-125, 2014. J. Liu, J. Li, and J. Tang, "Ultrasonic-assisted extraction of total carbohydrates from Stevia rebaudiana and identification of extracts," Food and Bioproduct Process, vol. 88, pp. 215-221, 2010. M. Puri, D. Sharman, and C. J. Barow, "Downstream processing of stevioside and its potential applications," Biotechnology Advances, vol. 29, pp. 781-791, 2012a. K. Jonnala, B. G. D. Kiran, V. Kaul, and P. Ahuja, "Patent process for production of steviosides from stevia rebaudiana bertoni." Patent. US 20060142555 A1, 2006. J. Vanneste, A. Sotto, C. M. Courtin, V. Van Craeyveld, K. Bernaerts, J. Van Impe, S. Taes, B. Van Der Bruggen, and J. Vandeur, "Application of tailor-made membranes in a multi-stage process for the puri?cation of sweeteners from Stevia rebaudiana," Journal of Food Engineering, vol. 103, pp. 285–293, 2011. A. B. Rao, E. Prasad, G. Roopa, S. Sridhar, and Y. V. Lakshmi Ravikumar, "Simple extraction and membrane purification process in isolation of steviosides with improved organoleptic activity," Advances in Bioscience and Biotechnology, vol. 3, pp. 327-335, 2012. V. H. Abelyan, V. T. Ghochikyan, A. A. Markosyan, M. O. Adamyan, and L. A. Abelyan, "Extraction separation and modification of sweet glycosides from Stevia rebaudiana plant." US Patent No. 7838044B2, 2010. V. Jaitak, B. Bikram Sinh, and V. K. Kaul, "An efficient microwave–assisted extraction process of stevioside and rebaudiose-A from Stevia rebaudiana Bertoni," Phytochemical Analysis, vol. 20, pp. 240-245, 2009. M. Puri, D. Sharman, and C. J. Barow, "Optimization of novel method for the extraction of stevioside from S rebaudiana leaves," Food Chemistry, vol. 132, pp. 1113-1120, 2012b. X. Y. Huang, J. F. Fu, and D. L. Di, "Preparative isolation and purification of steviol glycosides from Stevia rebaudiana Bertoni using high-speed counter-current chromatography," Separation and Purification Technology, vol. 71, pp. 220-224, 2010. M. Fantino, "Effets nutritionnels et métaboliques des édulcorants intenses," Cahiers De Nutrition et De Diétetique, vol. 46, pp. H35-H39, 2011. R. D. Mattes and B. M. Popkin, "Nonnutritive sweetener consumption in humans: Effects on appetite and food intake and their putative mechanisms," American Jounal of Clinical Nutrition, vol. 89, pp. 1–14, 2009. S. D. Anton, C. K. Martin, H. Han, S. Coulon, W. T. Cefalu, P. Geiselman, and D. A. Williamson, "Effects of stevia, aspartame, and sucrose on food intake, satiety, and postprandial glucose and insulin levels," Appetite, vol. 55, pp. 37-43, 2010. P. Narayanan, B. Chinnasamy, J. Jin, and S. Clark, "Use of just-about-right scales and penalty analysis to determine appropriate concentrations of stevia sweeteners for vanilla yogurt," Journal of Dairy Science, vol. 97, pp. 3262-3272, 2014. V. K. Tejo, S. Karsodihardjo, and V. K. Ananingsih, "Stevia rebaudiana: An excellent natural alternative for sugar replacer faculty of agricultural technology," presented at the The Third International Congress on Interdisciplinary Research and Development, Thailand, 2013. G. Jones, "Stevia, G1634, university of Nebrask –Lincoln Extension, Institute of Agriculture and Natural Resources." [Accessed April 8, 2014]. Available http://extensionpublications.unl.edu/assets/html/g1634/build/g1634.htm., 2014. R. Silva Cadena, A. Gomes Cruz, R. Rolim Netto, W. Freitas Castro, J. A. Fonseca Faria, and H. M. Andrè Bolini, "Sensory profile and physicochemical characteristics of mango nectar sweetened with high intensity sweeteners throughout storage time," Food Research International, vol. 54, pp. 1670-1679, 2013. A. Belš?ak-Cvitanovi?, D. Komes, M. Dujmovi?, S. Karlovi?, M. Biški?, M. Brn?i?, and D. Ježek, "Physical, bioactive and sensory quality parameters of reduced sugar chocolates formulated with natural sweeteners as sucrose alternatives," Food Chemistry, vol. 167, pp. 61-70, 2015. L. L. M. Melo, H. M. A. Bolini, and P. Efraim, "Sensory profile, acceptability, and their relationship for diabetic-reduced calorie chocolates," Food Quality and Preference, vol. 20, pp. 138-143, 2009. E. C. Morais, A. R. Morais, A. G. Cruz, and H. M. A. Bolini, "Development of chocolate dairy dessert with addition of prebiotics and replacement of sucrose with different high-intensitysweeteners," Journal of Dairy Science, vol. 97, pp. 2600-2609, 2014. R. S. Lothrop, "Physicochemical and sensory quality of chiffon cake prepared with rebaudioside-a and erythritol as replacement for sucrose," Thesis for Requirement of the Degree of Doctor of Philosophy, Department of Food Science and Human Nutrition, Colorado State University Fort Collins, Colorado, USA, 2012. U. Kienle, "Formulas for the use of stevia natural sweetener in foodstuff. Available https://stevia.uni-hohenheim.de," 2014. I. Prakash, J. F. Clos, and V. Prakash, "Stability of rebaudioside A under acidic conditions and its degradation products," Food Reserch International, vol. 48, pp. 65-75, 2012. ChromaDex, "Chromadex® acquires spherix consulting - spherix consulting." Available https://www.chromadex.com/Detailsp.aspx?Aid=693, 2014. Trini SA, Available http://www.steviatrini.com.ar/, 2014. Papaphilippou, "Papaphilippou & patisserie panayiotis ice cream LTD." http://www.pandpicecream.com/, 2014. Truvia Company, Available http://truvia.com/products, 2014. Diabetes has been contextualized as pandemic, but market supplying their food does not seem to grow in parallel with the problem. There are many substances on the market that will be useful as ingredients to produce foods for diabetic consumers, focusing on the sweeteners, which can be used for food processing with low calories, and low glycemic index. Natural or synthetic sweeteners have received renewed attention with the toxicological acceptance and commercial development. However, many of them have little prospect of becoming commercial ingredients because, they do not meet some of the key criteria for commercial success. The stevia plant and its products have potential for commercial uses as sweetener or therapeutic. Beside the two known main molecules that are intense sweeteners that are occurring in stevia (stevioside and rebaudioside A), the plant contain other compounds of nutritional importance for therapeutic uses. The acceptable daily intake or ADI of 4 mg/kg bw/day to steviol glycosides have been regulated to glycosides of stevia. Moreover, there exists production of stevia worldwide, with established procedures for isolation and purification of its glycosides and one of them has been approved for food use. Then, a solid market of diabetes-oriented products must emerge, for satisfying demands from these consumers.